These artful quilts are breathtaking to look at, and surprisingly easy to make. Fabric bias covers raw fabric edges in a quick, accurate technique. Wendy introduces simple blocks plus lots of variations and sample quilts. Detailed illustrations follow for a project quilt - or create your own. No curved-seam piecing, no raw edges, no stress. Fabric bias strips are the key to beautifully finished curves. 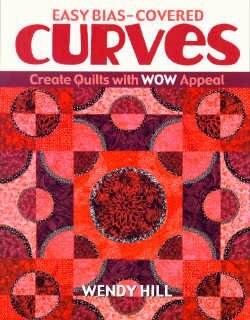 Great for quilters at every level - beginners love the simple technique, and experienced quilters can design their own variations. Match fabrics for a subtle look, or use contrasting bias for a vivid design element.